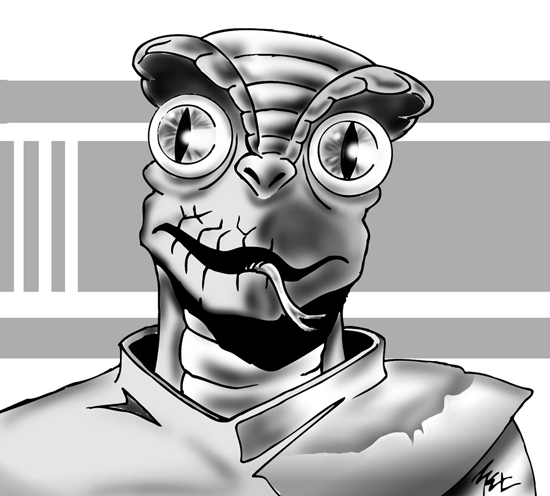 The Vudar are reptilian humanoids who live on a planet in Klingon space at the edge of the galaxy. Because of the Vudar tolerance for radiation, the Klingons allowed them to operate their own starships to police intensely radioactive regions of the Klingon Empire near the galactic energy barrier, and to exploit some planets which the Klingons could not use (due to radiation) if they paid the required taxes to the Empire. The Vudar built more ships than the Klingons officially allowed them to, and became increasingly restive. While they never became truly independent, they did keep more and more of the profits from the planets they exploited (although the Klingons were getting more from underpaid Vudar taxes than they would have if the planets had remained empty). By the end of the General War, the Vudar were semi-independent, and had taken over parts of Hydran space as well as "patrolling" parts of Klingon space. The Vudar never pushed the Klingons so far that the Empire would have to declare them to be rebels and crush them, and the Klingons never "cracked down" on the Vudar hard enough to force the Vudar into open revolt. At the end of the General War, the Vudar declared themselves "neutral" but this was a political fiction (accepted by the Klingons as it kept some Hydran space out of Hydran control and narrowed the front line the Klingon Western Fleet had to defend). The Hydrans accepted the fiction rather than seeing the considerable Vudar fleet fight openly on the side of the Klingon Empire. After the General War the Vudar were strong enough to break away from the Klingon Empire in rebellion. The Vudar were published in Star Fleet Battles Module F2 and further expanded in the Federation Commander War & Peace module . No exploration of the Star Fleet Universe would be complete without starships. We offer a full range of pewter starships in 1/3788 scale (most are two or three inches long) both as individual ships and in Squadron Boxes of five ships. Photos are also available to view samples of these pewter miniatures.